with the best cold brew coffee out there! . about ground coffee into the filter. water over it until the pitcher is almost full. Lastly, Place the cap back on the pitcher and store in the fridge for 12-20 hours. All you need to do is wait. In the morning, simply pour yourself a cup of fresh, brewed coffee and enjoy! It's as simple as that. The stainless steel filter uses dual filter technology to achieve the finest brew and keep coffee grounds out of your coffee. It eliminates the need to manually filter your coffee. The filter can also be removed easily for washing ad is reusable. When the brewing process is done, simply lift the filter out of the pitcher and trash the leftover granules. With this Cold Brew Coffee Pitcher you get the best of both worlds: Good coffee to serve and a beautiful pitcher to serve it in. √ BRING THE COFFEE SHOP HOME: With the Cold Brew Coffee Maker by Home and Above, you don't need to go to the shop to get great tasting coffee! In just 3 easy steps, make delicious cold coffee from the comfort of your home! Perfect for your morning coffee or just to serve your visiting guests. With this Brewer, you will be surprised by just how good your coffee tastes, and so will they! √ A PERFECT POUR: The 1 Quart coffee maker's narrow spout and carefully crafted handle makes for easy and clean pouring. You don't have to worry about espresso spills when bringing it to the table. √ FILTERING THE FLUIDS: The high quality removable mesh filter is what makes that perfectly smooth cold brew coffee! The filter prevents coffee granules from leaking into your cold coffee. When finished brewing, simply remove the BPA-Free filter, spill out the coffee grounds, and move the ring to the base of the lid. Put the filter away and pop the lid back on the pitcher and store in the fridge to enjoy late on. 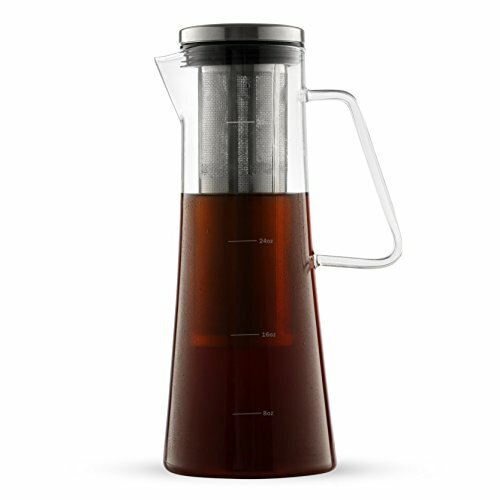 √ CLASSIC GLASS & STAINLESS STEEL DESIGN: Not just an excellent brewer, this Cold Brew Coffee Maker is an attractive glass pitcher too! With its timeless design, the glass Coffee Maker is nice enough to be kept on your table or kitchen counter. The durable, shatterproof glass pitcher brews up 4-5 servings, keeps your cold brew coffee cool, and looks great in your kitchen. A triple threat! √ 100% MONEY BACK GUARANTEE makes this your best bet for a no-risk purchase. We're sure you'll love your purchase, so we offer your money back if you are not! These are selling fast. Everyone wants to get their hands on our Cold Brew Coffee Maker! BUY NOW while our supplies are plentiful. Makes a great gift for friends, family, and co-workers! If you have any questions about this product by Home and Above, contact us by completing and submitting the form below. If you are looking for a specif part number, please include it with your message.